← When Should You Get Married? How to Avoid Becoming a “Bridezilla”! You CAN be in Control Without Going Crazy! My experience with brides is that most are very reasonable, very smart women who want their ceremony to be as close to the wedding day they’ve dreamed of during their childhood and that they want everyone — the wedding party, the parents and the guests, to have the best experience possible. So what goes wrong? I’ve spent many years in the business consulting world and have always told my clients that a failure to plan is akin to planning to fail. And my recent experiences as a wedding officiant have led me to believe that what has been true in the business world is equally true in the wedding world! I think that what may turn a perfectly reasonable bride-to-be into a “bridezilla” is simple panic. “Oh, my God! The wedding is only (insert number of months, weeks or sometimes even only days here) away and we still haven’t booked (insert venue, caterer, DJ/musician, cake maker, hair and makeup specialist, officiant, etc.). HELP! If you are a bride-to-be, the best thing you can do to avoid becoming a “bridezilla” is to begin the wedding planning process as early as possible after your fiance has “popped the question” and you have said “Yes!”. In a previous blog post, I provide some guidance about engagement length versus wedding date selections and I do recommend that you take a few minutes to read it. Beyond that, here are some hints to help you stay calm, collected and in control so that you can have the best wedding day experience possible. As mentioned above, start the planning process early! Set out a timeline of things that must be done and people/organizations that must be hired. Consult wedding related websites and blogs for lists of things you may want to consider so you don’t forget anything. Delegate what you can to your fiance, your family, and your friends if they are willing to become involved to that level. Keep a current list of the things that need doing and their status so that you don’t have to think about them constantly. Don’t procrastinate! You’ll go nuts! Also remember Murphy’s First Law: Whatever Can Go Wrong Will Go Wrong! But you know what? Your world will not come to an end if there is a glitch or two. This is normal. The hair and makeup artist will be late. Or you’ll be late because you stayed up too late worrying about the things you might have missed or that you might be late! See the list above to avoid those pitfalls. If you start the planning process early, make your hiring decisions on a timely basis and — very important — don’t “second guess” yourself — or make last minute changes that could have a negative impact on all of the other things or the overall schedule. As an ordained minister who serves as a professional wedding officiant, I’m usually one of the last people to be hired (see chart at left courtesy of WeddingWire.com). But I can provide you with an up-front consultation to let you know that the vows, ceremony elements and any special features (e.g., unity candle or sand ceremony, remembrances, guest comments, special songs, etc.) will be handled exactly as you want them to be. Venues are obviously first priority. And good photographers need early booking as well. 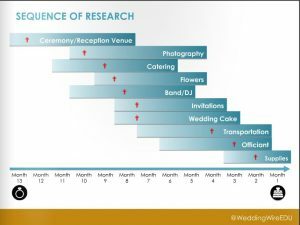 You can see the other major elements in the chart, but these are only a small portion of the things, people and organizations that you may want to consider for your special day. Thanks for reading this post. I’d love to have your feedback on it and please do feel free to share it on your social media channels with everyone you feel might find it interesting. 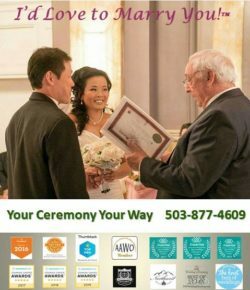 And if you are in the Portland/Vancouver area and need an officiant for an upcoming wedding, please do keep me in mind. I’d love to marry you!